We are a Portuguese couple that are happy to share our dream holiday apartment to other holidaymakers. We spend our holidays in Vilamoura for over a decade, and decided recently to purchase this apartment as this complex was our favourite from the many we visited. The garden is huge and we love to have a view over the golf course. Convenient ground floor with access to the swimming pool. Very calm complex. One bathroom, one shower room. dining table and four chairs; two sofas; TV and DVD player. Several golf courses within 5 mins. Outside: Large terrace and private garden with direct access to the shared swimming pool, and the manicured gardens of the closed condominium. Nice view of the swimming pool and the golf course “Golf Pinhal”. Sun loungers are provided free of charge around the shared pool. Utility Room: Iron and ironing board, vacuum cleaner. Cleaning / Towels / Linen / Maid service: Bed linen and towels provided. Linen changed weekly. Good location. Property would suit a family better than 2 couples but we adapted to make it work. 2 weeks and we didn't want to come home. A lovely apartment in a clean and quiet complex. The patio and garden lead straight to the pool. Solar do golfe is in a great location right next to the Old village apartments where there is a good and well stocked supermarket, some good restaurants and a nice little bar. The marina is easily accessible, 15 minutes walk, 5 mins in a taxi. Quarteria is also walkable and is well worth a visit, with much better value resteraunts and nice promenade and beach if you fancy a change from the more international feel of the marina. Paulo was very quick to reply to questions before we arrived and while we were there. A welcome gift of 2 bottles of Portuguese wine was a lovely touch. I would have no hesitation in staying here again. We stayed in the apartment for 8 nights and really enjoyed our stay. There’s plenty of space which was great. There are two bathrooms (one with a shower & one with a shower & bath). The apartment has everything you could need. It was very clean & had a lovely garden which lead to the main pool area. The location was perfect for us as we enjoyed eating out in the old village area & enjoyed the walk to the marina. The little train to the marina/beach etc. stopped just down the road which was a nice option to have when we went to the beach for the day. We had a fantastic holiday and the apartment was perfect. The apartment was extremely clean and had a lovely garden backing on to the pool area. The pool area is nice and relaxed and clean everyday. The location of the apartment was very good with the marina and beach close by. I would definitely recommend staying here. Our second stay at this fabulous apartment. 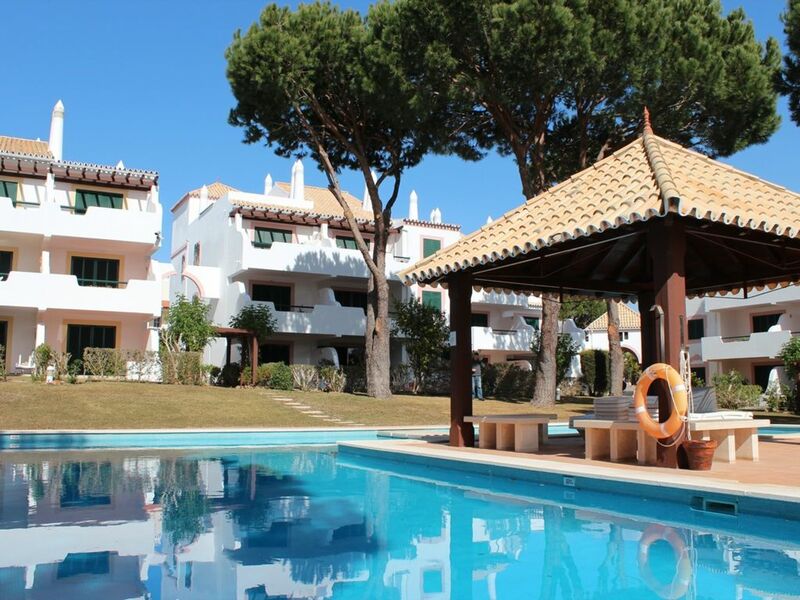 In a great location in Vilamoura Old Village. All home comforts, clean and well maintained. Fabulous ground floor apartment with a lovely garden and great pool area. Very obliging and helpful owner. Nothing too much trouble. Would recommend to friends and relatives. Distance to main airports: Faro 24 km, Lisbon 270 km, Seville 220 km. Vilamoura is at a 15 minute drive from Faro airport. Alternatively landing in Lisbon or Seville is also possible. If needed be, will be glad to give advice and driving directions. If you do not want to drive, a comfortable coach from Lisbon stops in Vilamoura (Lisbon - Faro route). Car recommended but not necessary. Faro: 24km. Albufeira: 18km. Portimão: 55km. Solar do Golf is a complex is situated in the Old Village (across the road from the complex with the same name), an exclusive area of Vilamoura with its own restaurants, bars and supermarket. There is also a tourist train which runs regularly to the marina and local beaches and stops directly outside the complex. Booking Notes: 30% deposit of the holiday value at the time of booking. Balance payable five weeks (5) prior to the holiday commencement. Damage Deposit - we require 350€, payable when payment in full is due 5 weeks prior to arrival. This is to be held against any damage or breakages and refunded within 2 weeks of departure. Changeover Day: flexible changeover day.